The Flower Bouquet Barcelona - Spain radiates happiness, love and sophistication. 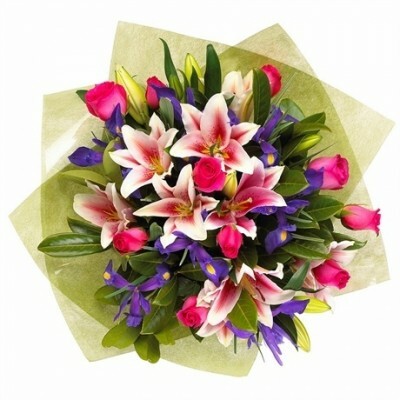 This vibrant bouquet of pink lilies, 10 pink roses and blue iris (which may be substitute for Peruvian lilies) will brighten the day of your special recipient in Spain. This is a perfect gift to manifest your love, wish happy birthday or to say thank you. Dazzling bouquet filled with love and affection to give as a gift to someone special in Spain. This combination of a joyful combination of pink lilies, 10 pink roses and blue iris (which may be substitute for Peruvian lilies) will amaze and astonish recipient.